This NBA Finals documentary is the first VR sports film worth watching. 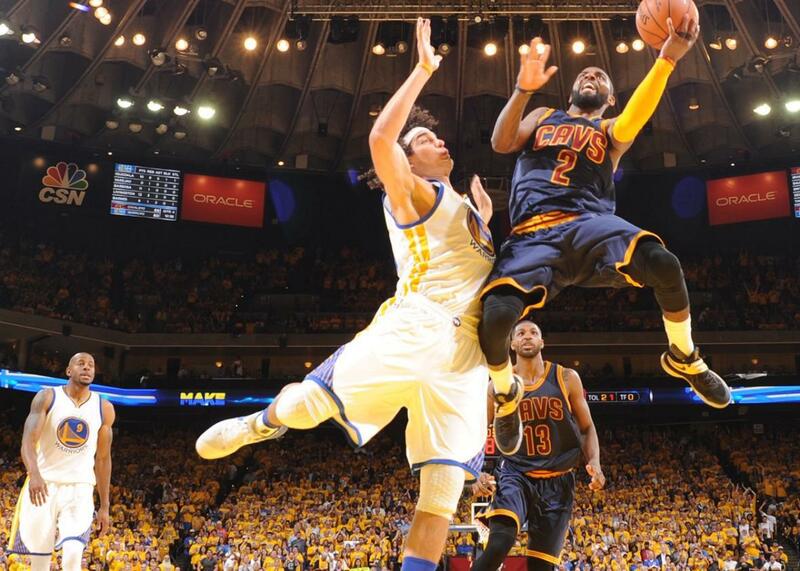 When Kyrie Irving skies for a layup in VR, your first instinct is to duck. But the biggest obstacle facing VR movies, according to some critics, is that viewers can look in any direction at any time, making it impossible for the director to control exactly what they see. In a May Scientific American column, tech writer David Pogue called audience attention “the towering problem that no VR filmmaker has yet cracked.” It’s part of why some VR experts, including Stanford University’s Jeremy Bailenson, think the medium simply doesn’t lend itself to narrative. For a film that breaks so many unwritten rules, the result is a surprisingly straightforward, watchable, and at times engrossing look back at a historic series of basketball games, from a perspective that’s worthwhile for more than its sheer novelty. Impressively, for a VR experience of its length, it’s rarely confusing or disorienting. Many early VR films feel futuristic and experimental. Some eschew plot altogether in search of a radically new vocabulary for the medium. In contrast, Follow My Lead takes its inspiration from slickly produced behind-the-scenes sports documentaries like ESPN’s 30 for 30 series, albeit without the provocative journalistic edge. You can get a vague sense of its aesthetic from the trailer below, which converts the footage to conventional, flat video. But the full experience is possible only in VR. Taking us from the pre-series media buildup through the Cavaliers’ victory parade, the film hops confidently from in-game highlights to crowd reaction shots to quieter moments in the teams’ locker rooms and press conferences. It captures the scene and the mood outside the arenas as well as in, juxtaposing idyllic scenes of the San Francisco Bay with gritty shots of downtown Cleveland. The plot focuses on the underdog bid by Cleveland and its star, LeBron James, to disrupt Golden State’s anointment as the greatest team of all time and bring their blue-collar city its first championship in five decades. In the films best moments, it reveals the key players—especially James—in their capacity as humans as well as performers. To film it, the NBA granted wide-ranging access to Oculus VR and the production company Missing Pieces. Much of the game footage comes from stationary Facebook Surround 360 cameras attached to the basketball hoops and held or mounted on the court’s sidelines, just above the team’s benches. The former vantage point proves well-suited to dunks and blocks; the latter, to arcing 3-pointers and close-ups of coaches prowling the sidelines. No doubt the production was extremely expensive, not to mention the priceless access. This is not the type of movie that an indie filmmaker could hope to imitate. Moreover, sporting events may be uniquely suited to VR filming, because you know in advance exactly where the action will transpire. For that reason, Follow My Lead can’t by itself disprove the doubters who see VR movies as a boondoggle. But it does offer reason to think that the medium has a real future with mainstream audiences. The film was shot on Facebook Surround 360 cameras, so you can turn your head and see what’s behind you. The film has one real shortcoming. Whether due to the limitations of VR filmmaking, the film’s relatively short length, or the simple fact that we know the series’ outcome before we begin, it does not fully capture the drama of the contests themselves. Oculus’ head of video, Eugene Wei, told me the producers debated various ways to convey the in-game context for key plays before deciding to let the highlights speak largely for themselves, with an occasional assist from narrator Michael B. Jordan. It’s a tasteful choice, but the downside is that we watch spectacular plays without really understanding their significance to the game’s outcome. For example, at the end of the decisive Game 7, we see a Steph Curry launch a three-pointer that clangs off the rim, and then the clock expires on a Cavs’ win. Only afterward do we learn that the final margin was four points, rendering Curry’s miss mostly irrelevant. What we do get is an enthralling new view of iconic moments such as James’ thunderous Game 7 chase-down block of Andre Iguodala, a play that the filmmakers rightly emphasize as a visual metaphor for the series. As impressive as the play was on TV, it’s even more so in 360 degrees, thanks to the sense of physical immediacy that VR uniquely conveys. From behind the basket, you see two extremely large men approaching very fast—and then, suddenly, there’s James, emerging from behind them and launching himself straight at your face as he rises above Iguodala to swat the ball away. Therein lies the chief appeal, of both the film and the medium. VR advocates call it “presence”—the compelling illusion of being there to experience something in person. Interestingly, this feeling is sometimes stronger in Follow My Lead’s off-court moments than it is when you’re watching in-game action, probably because the camera can get much closer. In one memorable scene, you hover directly over the shoulders of the Cavaliers players as they huddle in a tunnel somewhere in the bowels of Oracle Arena before Game 7. There, without any coaches present, James delivers a pep talk to his teammates in the voice of a battle-scarred veteran who has experienced enough disappointment to understand the magnitude of the stakes. It would be great footage even for a conventional documentary. But in VR, you feel like you’re part of that huddle. Look left or right and you’ll see your towering, thickly muscled teammates closing their eyes and bobbing their heads as the King speaks. Above you are rafters, behind you—I don’t know, because I wasn’t tempted to look. As in other key scenes, the directors left zero doubt as to where to focus your gaze. By the time James finished, I felt like I was ready to run out and beat the Golden State Warriors. When I asked Oculus’ Wei how he tackled the problem of audience attention, he said one technique his team has developed is to make sure that when they open each scene, the primary action is unfolding in the same place where the viewer was looking before the cut. Over time, he said, that should help viewers to trust the directors, so that they don’t feel compelled to glance all around them to get their bearings each time the scene changes. *Correction, Sept. 15, 2016: In an earlier version of this post, Cleveland Cavaliers player Kyrie Irving was misidentified in the photo caption.